moxie made: wfmw - magic. have you ever heard of magic erasers? until i got married, i had never heard of them. fmil introduced them to me. seriously, they will clean anything. they are the best things ever. on our bathtub, on the sink, on the wall. i didn't know about them for so long. if you haven't tried them, give them a shot. and see if they work for you! 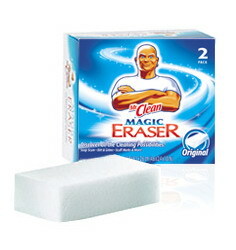 I've never tried Mr. Clean's Magic Erasers. Guess I should! Oh yeh. Me and Mr. Clean...we have a thing going. I can't live without him! I am always hearing people talk about how great the Mr. Clean erasers are. I don't know what I am doing wrong because they don't work at all for me. They will not clean anything that a wet paper towel will not clean for me.